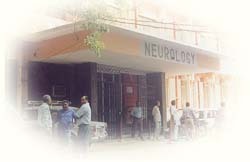 It was in the year 1973 that a separate unit of Neurology was created in the Department of Medicine. Ten beds from Prof. N. N. Gupta's ward in the Department of Medicine were earmarked for the neurology unit. A full-fledged separate unit of Neurology housed in a new building came into existence from August 1976 and administrative separation of the new department came in March 1977. Prof. Devika Nag was the first Head of Department (1977-1998). Subsequent Heads were Prof. A.M. Kar and Prof. Atul Agarwal. Presently, Prof. R. K. Garg heads the department. Under his able guidance the department is developing leaps and bounds. Postgraduate (DM) course in this superspeciality was started in the year 1981. More than 100 postgraduates have been awarded the degree of DM (Neurology) so far. At present there are 06 MCI recognized seats annually for the same. The department is the first integrated department of neuromedicine in this state and provides the major reception to neurological disorders of all types in the region. It has 68 beds. A full-fledged electrophysiology unit provides 16 Channel EEG and 21 Channel Video EEG. Charge for EEG is Rs. 300/- and Video EEG is Rs. 800/-. Medelec Synergy EMG & EP systems-4 Channel providing investigations: Motor NCS, Sensory NCS, F Wave, H Reflex, Needle EMG, RNST, CTS, Blink Reflex, SSR, VEP, BERA and Transcranial Doppler Ultrasound (TCD). Charges for EMG/ NCV is Rs. 400/-, Rs. 500/- and for TCD is Rs. 400/-. Fully equipped physiotherapy and speech therapy units were established for outdoor and indoor patients. This facility is provided free of cost. A fully functioned physiotherapy unit is attached with the department. The above unit provides comprehensive physical Rehab to Indoor as well as outdoor patients. Patho-kinesiological assessments of motor functions, exercise guidance and mobilization of patients with help of modern & latest gadgets. More than two thousand patients are treated successfully free of cost annually. These include indoor as well as outdoor patients. Internship is conducted for students who have successfully cleared then graduate physiotherapy courses. A fully functioned Speech Therapy unit is attached with the department. Speech & language therapy aims to provide high quality service to help children & adult with speech, language, voice and fluency difficulties. Diagnostic speech & language assessment for indoor & outdoor patients are carried out & results analyzed to design age appropriate therapy programs. Vocal Hygiene program for teachers, singers or professional users of voice. Home training programs are given to outstation patients. Therapy session is conducted either in groups or on an individual basis. Over 600 patients are treated annually free of cost. These include outdoor as well as indoor patients. Assistance in research as well as combined publication of articles and case presentations related to speech, language & voice therapy. Regular session of Botulinum Toxin in Movement Disorders and spasticity are held once in every three weeks. Here patients of Blepharospasm, Hemifacial spasm, writer's cramp, post stroke spasticity and other spastic disorders are injected Botulinum Toxin. On an average 25-30 patients are benefited from this facility every month. New OPD block with computerized facilities and centralized air conditioning is according to need of hour. Daily OPD running successfully with more than 98,000 patients attended in 2017. Similarly, more than 2500 patients were admitted in ward during 2017. Free MM breakfast and meals are being provided to admitted patients according to institutional policy.